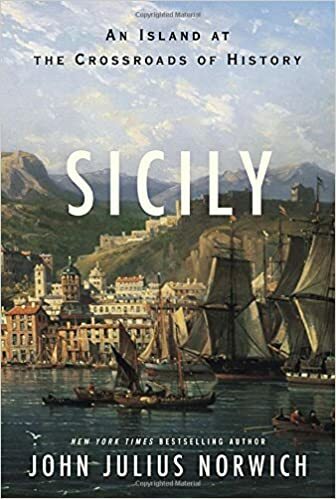 This morning I finished reading Sicily: An Island at the Crossroads of History, by John Julius Cooper (Viscount Norwich, thus known as John Julius Norwich). This book attempts to cover all of Sicily's history from antiquity to modernity, and generally does so. The book really begins in the Greek era, when Sicily was central to the imperial ambitions of Athens, and in common with other the rest of the Greek world, minor city states struggled and battled against one another. In some ways this never changes, as one power after another takes over the island, from Carthage, all the way to Piedmont in the Italian unification. I will say that I knew very little about Sicily prior to reading this book, and I certainly enjoyed most of it, but the Bourbon period is a hard slog, and the post unification era (150 years) is breezed through in just a few chapters which was very disappointing (the book effectively ends with the occupation of Sicily in 1943 [Operation Husky, which my Grandfather participated in as an ordinance officer]), giving little feel for contemporary people, and no idea what to expect for the future. So, I would recommend the first portion of this book unreservedly, but if you have little interest in court machinations of the Bourbons during the Napoleonic era, you are probably better off skipping that section. Now as for wargaming, Sicily was a battleground for the Peloponnesian war, Punic wars, and Second World War, so there are plenty of opportunities to have a battle or two set there. Operation Husky in particular seems to be pretty interesting, with its "midwar" setting, and mix of forces present. Apparently the above came from the Facebook page of a shop in Australia, and the major rumor mongers suggest that it is true... and that the Betrayal at Calth boxed set was the first product of this group. If this pans out, boxed sets of Epic, Necromunda, Manowar, and Battlefleet Gothic will have to make their way into my hobby room. And dare I say Warhammer Quest? Oof, that would be a must buy. This weekend past, my wife and kids were out of town, so I had a bit of a hobby weekend (when not working on painting a bathroom, laying brick, or other household chores that seem to accumulate). Previous years when faced with such weekends, I have built and painted a Tau platoon, and built an IG platoon twice the size of the Tau one (and which consequently I am still laboriously painting). This year I worked mostly on a project which is still under wraps, and few other odds and ends. I do not seem to have completed anything, and certainly not all the projects I wished to, so it seems a bit frustrating. I did get a little bit of work done on an idea which has been percolating around in my brain for a while. At work, we have a Keurig coffee machine (actually right outside my door) and the pods come in these boxes. A couple times a week, I see these boxes in the trash, and it got me thinking about reusing them as terrain. As it turns out they are about 4.25 inches wide, and 6 deep, and about 7.75 tall. To my mind's eye, these started to look like row houses for a futuristic city... however, at 4.25 inches wide, they are too big to fit two houses on the 8" squares I have planned for my city terrain. Further, the boxes are made from fairly flimsy cardboard, and so not very suitable for a finished building. 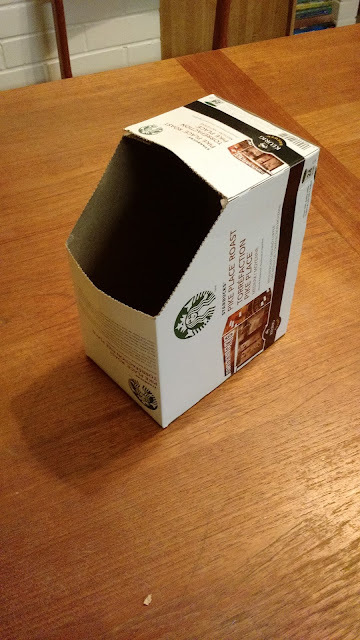 I plan to use just the shape of this box, but replace all vertical surfaces with foam-core cut to be slightly narrower than the boxes. So much for workplace recycling! 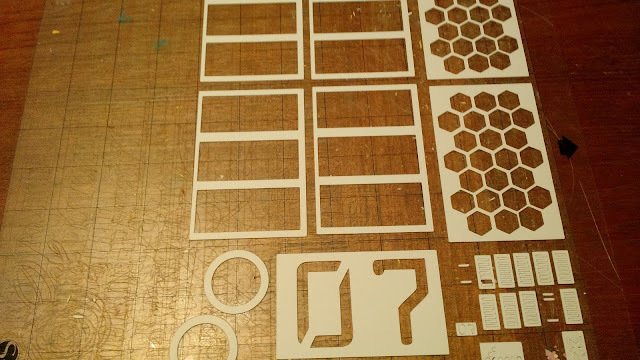 I used our Silhouette Cameo, a computer controlled cutter, to make some bitz and templates for the building, which was very interesting, and certainly more exact than anything I could cut with a knife. (as proven earlier that same day when I mangled some foamcore). The picture above shows a couple of templates I made, window frames for two buildings, and a bunch of vents. I stacked up the window frames and vents, and with super glue, effectively made them into stiffer hard pieces, suitable for construction. The hex spray templates are for a set of rooftop solar cells, which I had made out of a magnetic hotel door key and some sort of toy packaging. Anyway, that is what I did this weekend, what about you? Not a second Heresy, just a second post about it. Went to the FLGS this afternoon while running errands, and inquired about the Hours Heresy game, Betrayal at Calth. The guy working the counter had no idea what it was... So much for GW's assurances that there would be a demo copy in store... it will probably show up next week. 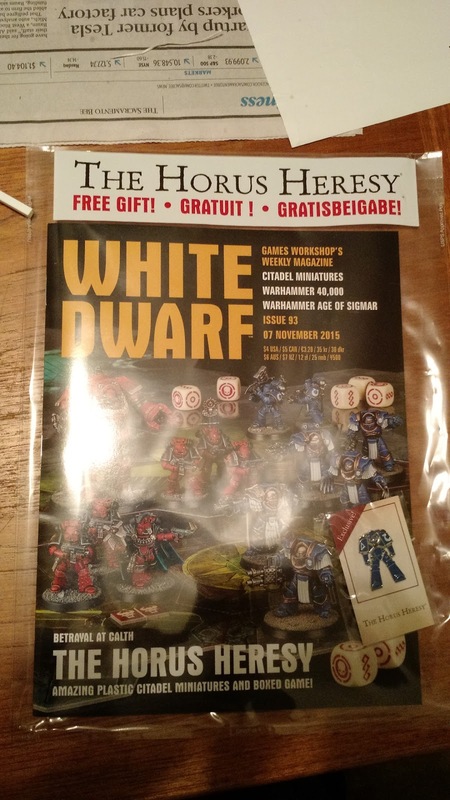 They did have the White Dwarf though, which was surprising as usual WDs accompanied by free gifts sell out. Once I pointed it out to the guy at the counter he bought the last one himself.